Farmhouse styling is perfect for a white bathroom due to that classic home design appeal that it is well-known for. 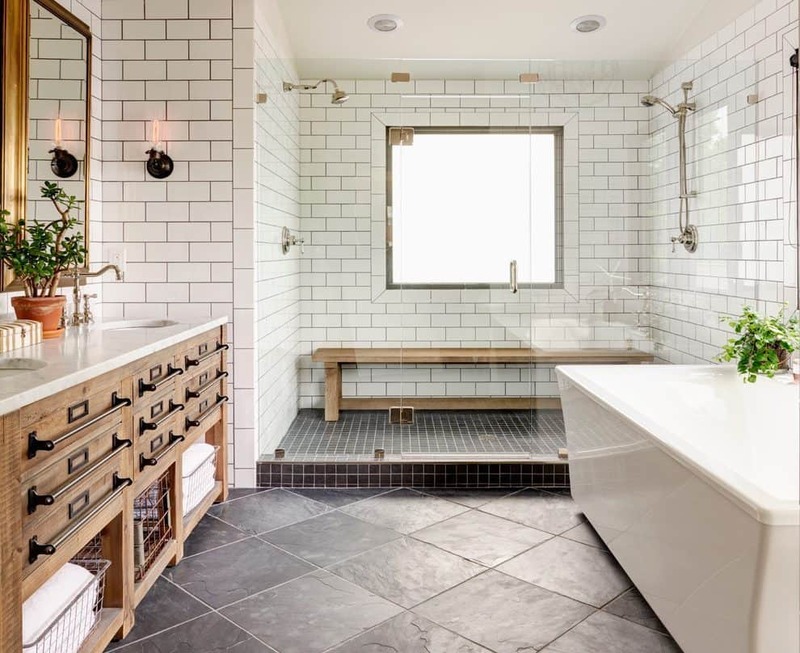 Add wooden bathroom furniture throughout the space to really bring out that farmhouse feel. Consider a blonde wood vanity with double sinks to enhance your interior decoration style. White comes in numerous different hues. Therefore, if you are fond of white, but don’t want to use bright shades of white consider darker shades of white such as off-white, grayish white, or even beige white. These colors work well with a farmhouse touch in your beautiful homes. Add wooden ship artwork, a standalone tub, and/or both for that traditional farmhouse feel. Paint your walls white and add a standalone tub with copper touches. The design ideas of a chic bathroom comes from having a modern renovated space with classic touches. Add a stool next to the tub for an elegant touch. A spa-like feel is perfect for a relaxing touch that is still full circle. Consider adding chic curtains that allow lighting to come through but still have an undeniable softness to them. Contemplate adding large mirrors for an adding hint of beauty in your house plans. What better way to renovate your bathroom than to add a spa-like feel. Hues of white are perfect for a spa-like aesthetics because of how calming it is. Keep the home decor simple and sensible, but have structured lighting pieces that are calming. Accomplishing this will give you that spa-like feel in a perfectly functional way. 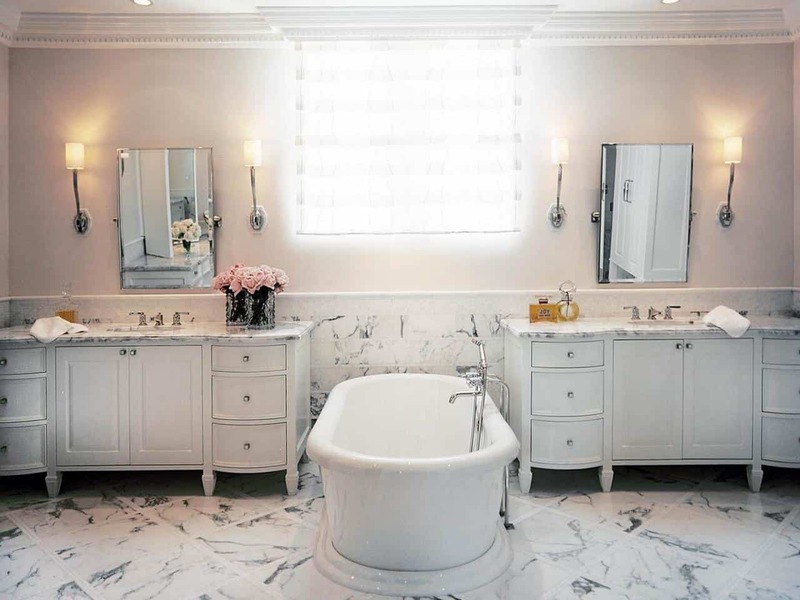 An extravagant white bathroom may not be for everyone. Which is where a minimalist bathroom furniture and design ideas will come in handy. The key is working with a few statement pieces and allow them to make a bold focus. Add glass doors to your standing tub to seamlessly expand the space. 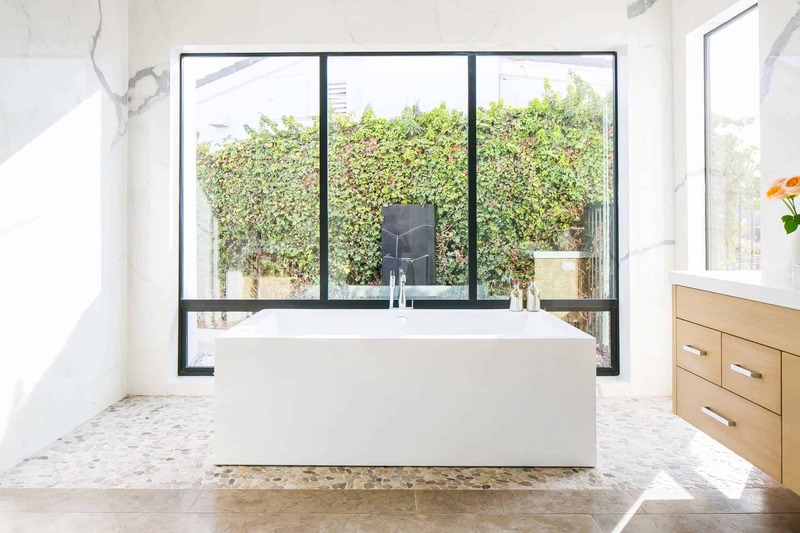 A minimalist design ideas paired with crisp white elements brings a royal feel to the architecture design of the bathroom in yur design homes with a hint of genuine calmness. 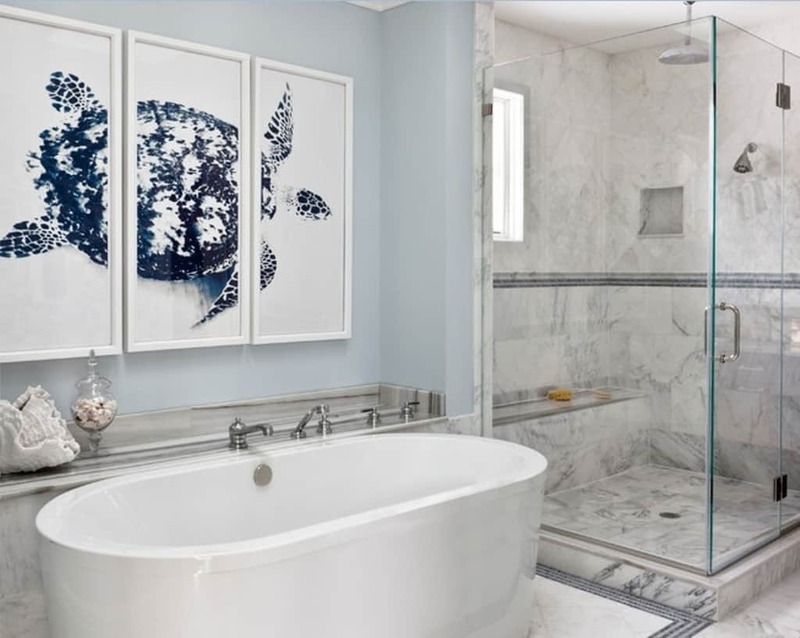 White tiling can be the perfect addition to this type of bathroom because it creates a seamless appeal that flows in an airy manner throughout the area. Farmhouse design ideas can be used all over the home due to how versatile it is. Which is why so many homeowners are drawn to the style. This is exceptionally true for the bathroom area and bathroom furniture. Use darker wood or even a few pops of aqua blue for the perfect farm house appeal. Beach house styling is quite popular this time of year, because of the weather. Therefore, if you have a smaller space this decorating style could be perfect, especially when it is paired with stark white interior design. Add rich dark wood to create a seamless contrast between the two hues and have a rich beach house aesthetics. Additionally, consider floorboards on the ceiling for a grander effect. Blue is the perfect addition color when you want to bring a space back to life with as little bit of different hues as possible. 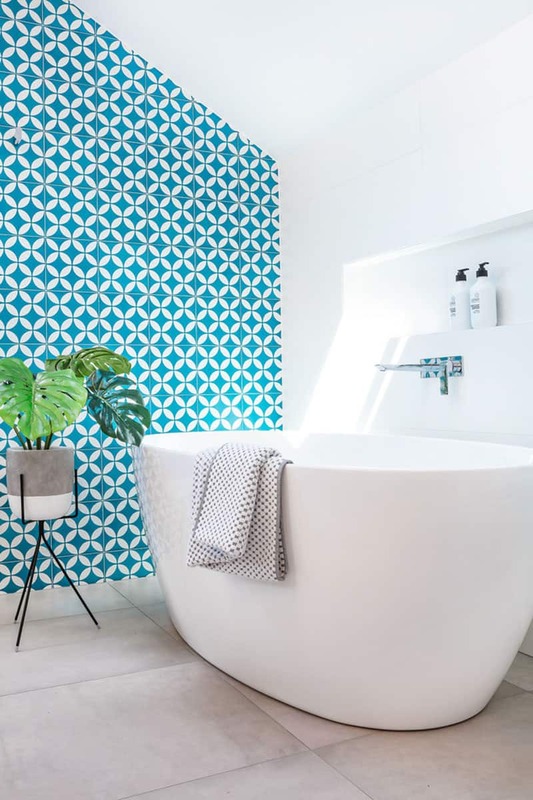 Consider having a statement wall with a rich blue pattern. Doing so will bring a calming effect while still having most interior design piece be white.